According to the National Safety Council, there are about 10 million car accidents each year. Not all of them are big crashes, as this number includes parking lots scrapes as well as multi-car pileups. This number isn’t meant to scare you, either, but it does put a car crash into perspective. In fact, if you’re an average driver, you’ll be in a car accident about once every 17.9 years. Therefore, it might be helpful to know about the most common injuries a car accident can cause. Your head is one of the most vulnerable parts of your body. Even if you had your seatbelt on, head injuries can happen. Even a minor rear ending can result in a blow to the head, which can lead to a mild concussion. Brain injuries can also be more severe and impair vital functions, such as your speech, memory, vision, or concentration. Other head injuries can affect your jaws or your eyes. If you receive a blow to the head or are struck by flying car parts, you may suffer partial loss of vision or even blindness. During a crash, an accident victim may also bang against the dashboard or steering wheel, which can result in the loss of teeth, jaw fractures, or other dental injuries. Not all injuries are immediately apparent. It’s quite possible that you only feel mild discomfort after a car accident, but eventually the pain may radiate to your arms or legs and affect your range of motions. The most common neck or back injury is associated with whiplash. Whiplash is caused when the neck is stretched and quickly snapped back into place. It can damage the vertebrae, ligaments, discs, and even the spinal cord itself. Severe back injuries can result in chronic pain. A major accident can even cause someone to become paralyzed. Unfortunately, some car accidents also result in fatalities, which can happen if the neck is broken after receiving a blow. The placements of airbags inside of dashboards and steering wheels have greatly reduced the severity of injuries to the chest. Without the airbag, a collision can break ribs and the breastbone, especially if the passenger wasn’t wearing a seatbelt. Even with airbags in place, fractures of ribs and injuries of internal organs can still occur. During a car accident, it’s also possible for abdominal organs to suffer. If the collision was from the front or the side, the liver, spleen, and kidneys are particularly at risk. The impact during a major collision can lead to injuries of arms, hands, legs, and knees. Legs can get injured when they are smashed into a part of the car during the collision. Knees are susceptible to meniscus tears if they are turned or twisted during the impact. Ankles, feet, and toes can also be sprained or broken in a car accident. Since it’s natural to brace yourself with your arms and hands, broken arms aren’t uncommon. You may even just hurt your wrist by grabbing onto the dashboard to prevent from banging into it. The crash may even just affect one of your fingers if it was bent unnaturally. While some medical problems will be immediately apparent, it’s possible that it takes time to notice the full extent of your injuries. For example, you may feel minor pains in your neck and back that later get worse. In any case, it’s important to see a doctor right away to diagnose and treat you. Some injuries can get worse if left untreated, too, which is why receiving medical care right away should be your first step after an accident. A major car accident is nothing to joke about. 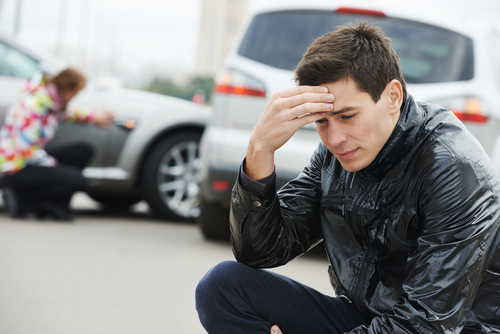 Car accidents can involve serious property damage and extensive physical injuries. If these injuries affect your ability to work or live your life as you did before, the accident can cause emotional problems as well. You might suffer from depression, especially if your life has been irrevocably changed. Your emotional problems could be of a temporary nature while you’re going through physical rehabilitation. At The Harr Law Firm, our extensive experience allowed us to help numerous clients after a car wreck. We will take care of the paperwork and deal with the insurance adjuster to negotiate your settlement for you. This allows you to focus on your health and get the treatment you need. Give us a call or fill out the contact form to get in touch.